Teaching your horse to lie down on command is an extension of natural behavior for the horse. It is helpful to have a reward system such as clicker training in place with your horse. Asking your horse to lie down is a complex trick to perform, so it is helpful to teach him simpler tricks first. With patience and practice, you and your horse will strengthen your bond. Begin asking your horse to perform an easy trick, such as pushing a ball or touching an object with his nose. When he naturally does the behavior you seek, click the clicker, or say the word or sound that lets him know he did what you wanted. Give him a treat and cue him to repeat the activity. Use your clicker or praise word followed by a treat each time he does what you ask. After some repetition, he will understand that the right action earns a direct reward. Set the stage to encourage your horse to lie down naturally. If it is warm, you may hose or sponge him off to entice him to lie down and roll. A horse typically also likes to roll after exercise, whether you ride or longe him. Take off his halter and lead line, if he's wearing one, and give him plenty of space to choose a spot to lie down and roll. 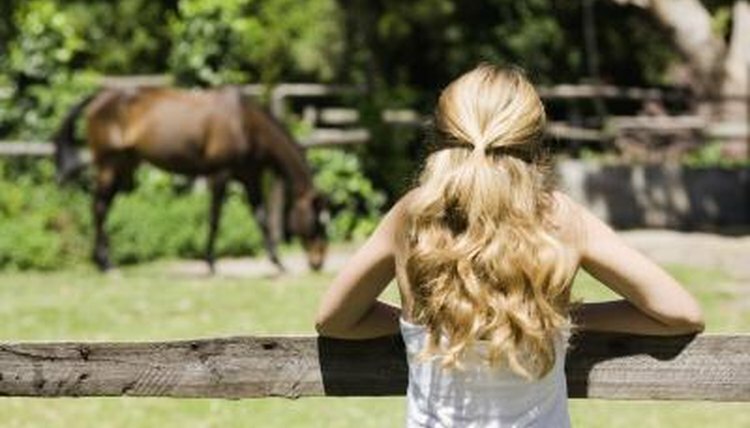 Watch your horse carefully by standing near him but not right next to him. You may have to wait for just a moment, but it may take far longer for him to lie down and roll. Allow him the chance to exhibit natural behavior, and give him enough space to choose a place to roll. A horse might choose an area of dry dirt or a muddy spot. As soon as his body lowers to the ground, use your clicker or praise word. He may get up immediately, but give him a treat and wait again. It may take several attempts before he understands that you are praising a particular action. You can practice this scenario daily until your horse understands your cue. Praise your horse only after you've asked him to lie down -- not when he chooses to perform to avoid an unexpected miscommunication.